The Costa de la Luz offers quite a contrast to most of its Costa cousins. Facing the Atlantic on Spain’s most south-westerly stretch of coast with Portugal to the north and Gibraltar to the south, it’s often described as Spain without its make-up. This is a quiet corner of the country which is about as far removed from Benidorm as langoustines and artichoke with truffle dressing is from boiled beef and carrots. Ever the dismal linguists, the British have struggled to pronounce Jerez properly since the days of Francis Drake who, incidentally, nicked about 3,000 kegs of wine when he sacked the city back in the 16th Century. Nevertheless there remains a strong bond between this region and Britain. One manifestation is the names of the sherry producers; Sandeman, Harveys and Osborne. 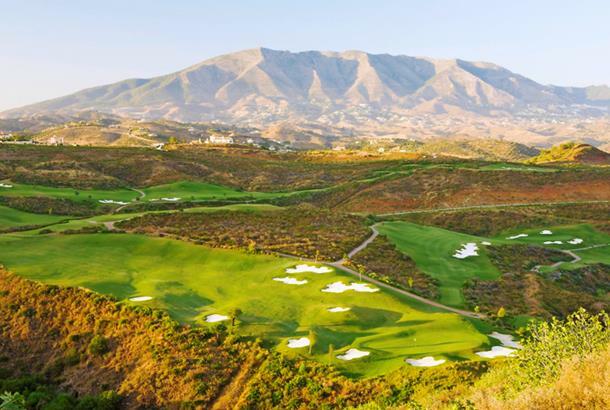 Golf provides another strong link between Brits and the Costa de la Luz. Although not liberally sprinkled with famous names you might recognise, there are plenty of quality courses here to keep most golfers happy. Designed by Jack Nicklaus, Montecastillo has played host to the Volvo Masters and produced such illustrious winners as Lee Westwood, Darren Clarke, Miguel Angel Jimenez and Padraig Harrington. It is quite simply breathtaking with wonderfully elevated tees, huge bunkers, lots of water and splendid greens that are as true as they are quick. If F1 cars or superbikes are practising on the neighbouring Jerez racing circuit, it won’t be the quietest round but it will be fun. Two other courses close to Jerez certainly worth playing are Sherry Golf and Arcos Gardens. Opened 10 years ago, Sherry Golf is fairly hilly, rather demanding and, at about 7,200 yards off the tips, pretty long. El Rompido sounds a bit of fun and that’s precisely what it is. There’s the original South course, which annually hosts the finals of the Daily Mail foursomes, and now a North as well, which tends to be a bit quieter. July and August on the Costa de la Luz are hot and dry, with daytime temperatures rarely deviating from the high 20s and low 30s. Spring and autumn temperatures range from 16°C to 20°C, with very little rain. Winters are pretty mild, too, with highs of around 17°C and an average seven hours of sun a day. There are as many different types of sherry as there are ways of making bogey. Some sound familiar like Fino and Amontillado, while others like Manzanilla, Oloroso and Palo Cortado are less well known over here. Visit a bodega and try as many as you dare. BA, Iberia and Flybe are the key airlines flying to Jerez; between them, they have flights from all the London and most provincial airports.